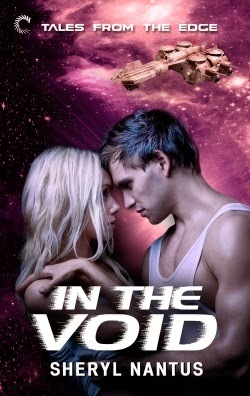 IN THE VOID (Carina Press) is book #2 of Sheryl Nantus' space opera romance series Tales from the Edge and you, my dear passengers, have an exclusive first look at the cover! At the risk of jinxing things, I must say that SFR readers are getting positively spoiled with representative covers! I used to blog quite a bit about the lack of such cover images and now ones for books like IN THE VOID are quite common. Yay! Catherine Rodgers doesn't like Mercy ships, or the courtesans who work on them—not after her husband left her for a Mercy woman. But after her yacht gets blown up to prevent her from cracking the lid off a corporate scam that’s left hundreds dead and a few people very rich, the only ship around to save her is the Bonnie Belle. Sean Harrison has worked as one of the Belle’s courtesans for years, bringing happiness to countless women along the space lanes. When he’s asked to care for Catherine while the Belle brings her to safety, it should be just another job. Somehow it’s anything but. Sean is captivated by Catherine’s sense of justice and responsibility. And Catherine finds a softer, more emotionally intelligent man in Sean than she expected. Drawn together in darkness under the threat of death, they find the beginning of something lasting. But with pirates after the Belle and a price on Catherine’s head, that beginning might be all they get. Like Firefly-esque sci-fi romances? Learn more about the first book, IN THE BLACK, at Carina Press. You can also follow Sheryl Nantus on Twitter: @SherylNantus.